So, for my senior recital (I'm a music education major) I was rather nervous. I didn't want to do it, I was paranoid nobody would be there, etc. My Sigma Alpha Iota sisters (it's a women's music fraternity) moved our meeting an hour earlier so they could go to the recital, and many of them did. But, the music fraternity my brother's in moved their meeting back as well so they could go to my recital (not SOP). They all lined up in their Phi Mu Alpha jerseys in the front of the recital hall and sat in a row together. When I walked out, I had a hard time not laughing at them all sitting there. I thanked both groups with cupcakes, cookies and deer jerky at the reception afterwards. I still felt like I needed to do more, so last week I asked one of the brothers what type of cookies he thought I should bake. His response was Oreos covered in chocolate chip cookie dough. I had never heard of this, and he was a bit stunned by such a response. Naturally, I turned to my handy-dandy Google and found a recipe on the Bakerella site. - Put the oven on 350*. - Cream butter and sugar. - Add vanilla and eggs, beat until combined. - In a separate bowl, mix flour, salt, soda until combined. - Slowly add the flour mix to the sugar mix. - Add chocolate chips and stir until just combined. - Take a golf ball sized piece of dough (cookie scoop, etc) and flatten it out somewhat. Wrap it around the Oreo. Make sure it's all covered and there are no super-thin parts - these will leave exposed Oreo after baking. - Place on a parchment paper lined pan and bake about 11-16 minutes. - Let cool 5 minutes, then remove to cooling rack. I made 2 batches of these, and had a few broken Oreos left over. It made about 55 cookies between the two batches. Another plarn bag. Yeah, I love to crochet with this stuff. It's from this pattern on Ravelry. I kind of wish I had used a larger hook (I used the one the pattern called for) since the single crochets at the top and bottom are a bit stiff. The mesh section is also a little tight on certain rows. The plarn is from big transluscent bags that come in cases of t-shirts my parents get for their screenprinting business. They're a little harder to work with than regular sized bags, since you have to fold them more times, and it's harder to keep the strands from knotting up. I really like the color of the finished product though, so it's worth the fight. The little black flowers are from some trash bags that I had used to cover my backpack in the back of the truck on the way to the camp. In the picture it looks like the bottom is wider than the top, but in reality it's not. It's just the way the picture took. OK, so some won't call 24g 1/16" micromaille, but I do. It's itty-bitty and a pain to get decent closures on. But, at the same time, I love the feel of it and the way it makes Euro 4/1 and Byzantine look. So dense, yet flowing at the same time. This one, I just finished today. It's in Euro 4/1, 24g 1/16" stainless steel. I used to have one like this a few years ago, but I traded it at the Louisiana Ren Fest to one of the vendors and got some awesome earrings and ear cuffs for it. I'm partial to the tube clasp on it. I had been saving it for this project, and finally got to sit down and work on it. I wish I could remember where I bought it at, in case this one breaks. Ah well. 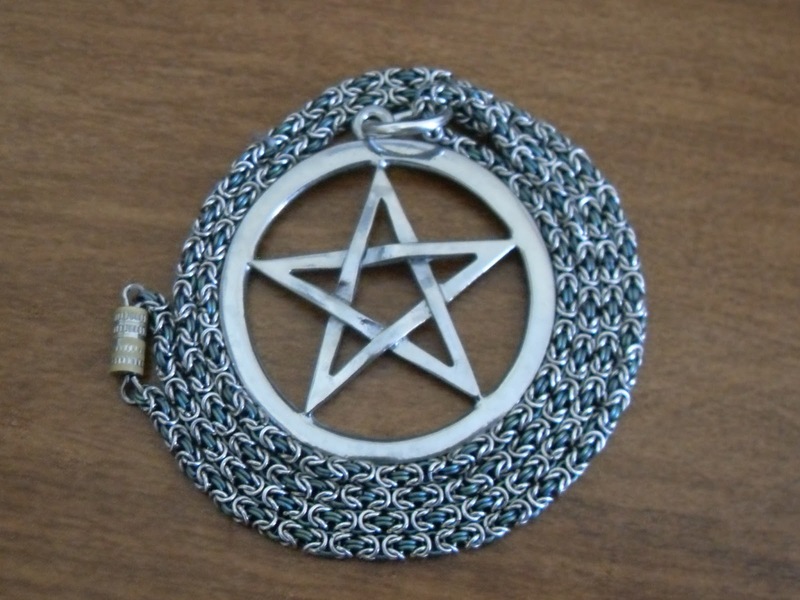 This is the chain and pentacle I wear day in, day out. I finished this chain a while back, but just now got around to taking a photo of it. These rings are 24g 1/16" as well, in sterling silver and green anodized titanium. The weave used is Byzantine. At this AR, the weave is almost round instead of its usual square-y-ness. 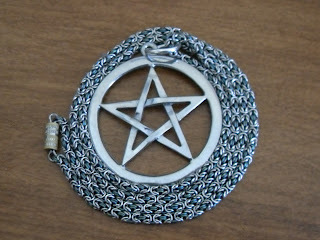 If you're interested in learning more about chainmaille, this is the best site on the web for it - MAIL. So I really like this pattern. It's the Market Bag pattern at Lion Brand Yarn's website. It's for their cotton yarn, but I did it with plastic bags. Because of this switch, I also used a "J" hook instead of the "H" they call for in the pattern. Normally, I use softer/more pliable plarn (plastic yarn). It's easier to use the kind that WalMart bags are made of, mainly because they're almost all made of the same weight of material. This bag, though, is made from all those other plastic bags you get, such as: bread, carrots, toilet paper, paper towels, red beans, celery, tortillas, dry cleaner bags and many, many others. This makes for a much slower construction. It also yields a slightly lumpier finished product. Over time I think it will smooth out some. The bottom flattened out a good bit after just the first use. The bag is rather large. It's 14" wide at the bottom and about 19" tall (including the handle). It has a little stretch, but not much. Unlike other reusable shopping bags, it doesn't fold up really small or anything. He's a very sturdy little fellow though, and I like his colors. So I know I posted last year about drying wild onions, but this is kind of the updated version. Dad was rather wary of having an overpowering flavor if he just used dried wild onions as you would green onions, but those fears were groundless. We used the hell out of some wild onions over the past year. Solution? Plant the whole two back rows of the garden with green onions (and lettuce, as well - makes for interesting cutting of food back there). My mom and I have been spending at least 1 day a weekend for the past 6 weeks or so cutting onions in the garden, chopping them up and sticking them in the dehydrator. The only problem is one we encountered last year as well. Anything as lightweight as green onions chopped in itsy-bitsy pieces blows everywhere with the fan and makes a beautiful green mess. Solution? Well, we tried laying another sheet and rack on the one with the onions, but that seriously limits how many trays you can use, and only cuts back the blowing away problem by about 80%. All that hard work, you don't want to lose those onions. Mom and I came up with the greatest idea (other people probably have as well). Sew a bag of thin cotton material and clothes-pin it shut. The onions won't blow away! It might take a bit longer to dry, but I can handle that. We can stuff about 4 or 5 bags of the onions in the dehydrator at a time, depending on how full they are. Just stick them on the racks like you would the regular sheets and walk away. I know. Shameless plug. But hey - I'm 3rd trombone in the big band, it's my school, it's my blog, and trombone players have very little shame. The concert is Saturday, March 2 at 7:30pm in Angelle Hall auditorium. That's University of Louisiana at Lafayette campus (in, ah, Lafayette, LA) for anybody in the vicinity. Tickets are $10, $5 for students, free to ULL people with your cajun card. Info for group tickets is on the poster (ie, phone number to call). For anybody who doesn't know, Gordon Goodwin leads the Big Phat Band. He's a composer and arranger. He plays saxes and piano very very very well. We'll be having an open rehearsal with Goodwin working the UL Big Band on March 1, 7:00-9:30pm. It'll also be in Angelle's auditorium - anybody's welcome to come. The same goes for 9:30am on March 2 - he'll be doing clinics with area high school jazz ensembles. These rehearsals are also open to the public. If you're a big band/jazz/music supporting person and in the general vicinity, come on out to hear us. It'd be greatly appreciated. This is the poster. It's got all the same info on it, but prettier. It was a great concert. Goodwin was a great person to work with. Great job to the high school groups that had clinics that day with him as well. Thank you to everybody who came out and listened, you make it possible for us to keep having concerts like this. Now for some pictures from the performance itself. My dad took a ton of pictures. I like pictures. First picking of last year. Since we had MLK day off school, it gave me some free time to start seeds. Peppers and tomatoes. I've never successfully grown tomatoes, from seed or plant, so hopefully these will work. I was stuck at school this past weekend, and rather upset about it. I had to take an evil standardized test, PRAXIS 0113 (ie, a music content test to go be a teacher) Saturday at 7:30am, and was moping around the dorm the remainder of the time. 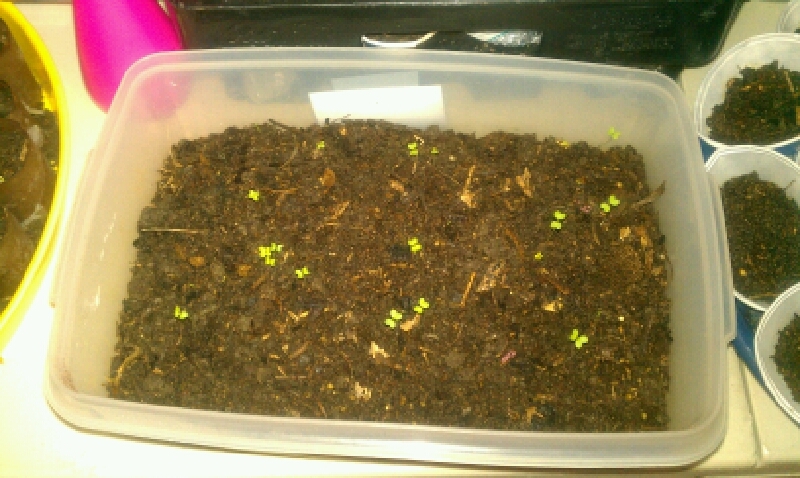 In an effort to lighten my heart, Mom took pictures of some of the seeds sprouting and sent them to me via her phone. This explains the somewhat debatable quality of the pictures. As you can see, we were short on things to plant in. I had 2 dozen and a half cardboard egg cartons and 3 single dozen cartons. For what I was planning on starting, that was plenty. My mom got seeds for my dad for his birthday, though, and that quickly ran out. 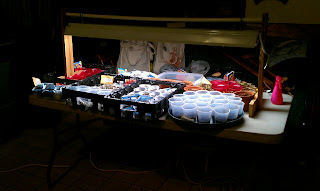 So I moved into plastic cups that were 10 years old. Then paper cone shaped cups of the same age. Then toilet paper rolls we found under the bathroom counter. Then the Christmas peppers, being last, got stuck in an old Rubbermaid I accidentally threw the lid away for a few weeks ago. We got the majority of our seeds from this wonderful dream book: The Pepper Gal. I want just about everything on her site/in her catalog. Mom got some salt peter(re? I can't spell.) 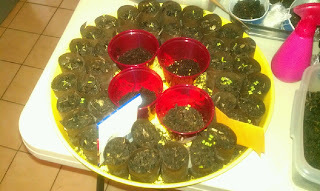 On her site, she said if you soak the pepper seeds in it mixed with water, they sprout quicker, iirc. It wasn't expensive, we were shopping, so Mom got some. Note to self: wet seeds are a pain in the posterior. 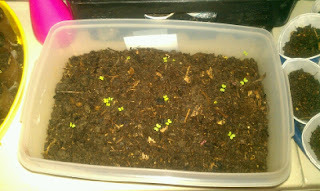 Christmas Pepper seeds coming up. I had run out of individual containers by then. Since we had such a bountiful pepper crop last year, it was decided we needed to do the same for this year. Well, not quite the same. All we grew last year was jalapenos, banana peppers, cayennes and Christmas peppers. And 3 tiny purple ornamental pepper plants my aunt gave us. They turn brown when pickled. :( I wanted them to keep the pretty purple. Anyway. We use Zataran's dried bell pepper by the ton. When I had done enough batches of bread and butter banana peppers and we were tired out of stuffed ones, I started dehydrating the banana peppers. They work great in place of bell peppers. The only thing was, it was the end of the season then. So we barely had any for long. Mom's remedy - buy a ton of seeds this year. I think there were only 2 bell pepper packs among her purchase...yet that's what spurred the shopping spree. Jalapenos, Banana peppers, Bell peppers, Poblano peppers, Cayennes, Green Chiles, Habaneros and gods know what else. It's okay, because we'll use them all or give them away or something. I'm excited. Oh yeah, and Cajun Belle Peppers. After reading so much about them on this awesome blog (http://oldworldgardenfarms.com/) I decided we needed to try them. So I'm guilty on that one. Mom also got 2 packs of cherry tomato seeds and 1 pack of beefsteak tomato seeds. I'm really, really hoping they do well. I want to can some salsa BADLY. It's my dream to can some homemade salsa. I know, I need a life, but I've wanted to for years. Assuming Dad doesn't eat all the tomatoes, I'll have some for canning hopefully. Also, in an effort to aid my hideous memory, I downloaded/printed/actually filled in this awesome little calendar/datebook/garden log thing from Little House in the Suburbs. Find it here. Once it gets a little later, we'll stick the squash seeds in the ground, along with cucumbers and such. Dad wants to grow sweet potatoes this year, which would just make me the happiest little coonass in the world. Hopefully that works out as well, and we have enough garden space. Right now, we've got mustard greens and lettuce and green onions in the garden. It'll be pretty crowded this year in there. My babies just growing away.